Home » Best Mattress » What’s The Best Innerspring Bed For 2019? What’s The Best Innerspring Bed For 2019? Although an innerspring is one of the oldest bed types, they're still trendy. And it doesn't mean they are less durable or too firm like some people think. Typically, they feature a steel coil core (support system) with a padded layer, or a foam on top if it's a hybrid. This provides you with a comfortable, flexible, and supportive surface that'll keep you cooler than most other bed types (most notably, memory foam). A modern innerspring base also allows for natural body movement and limits motion disturbance, which is excellent for people sleeping with a partner. Note: There are many types of innerspring mattresses – the quantity, design, and thickness (or gauge) of coils varies greatly. Plus, some are “hybrid” beds, which can be either topped with memory foam, latex, or even gel, and the depth and density of the layers can also differ. All of this variety can make choosing the right model difficult. But don’t let that put you off! We’ve reviewed many of the highest rated innerspring brands in this article. Saatva offers an incredibly well-made luxury innerspring bed that is actually affordable, and what many people view as a major upgrade from an old fashioned type of design. It is delivered and set up in your home for free, and the company will remove your old mattress without an additional cost as well. What makes it unique? This brand has not one layer of coils, but two in a coil-on-coil pattern. Connected coils line the base and give a deep bounce while individually pocketed coils on top help minimize motion transfer and add contouring. Saatva has a few more features that make it a top pick, like support enhancements to the lumbar region to promote healthy spine alignment and a Euro pillow top for pressure relief. 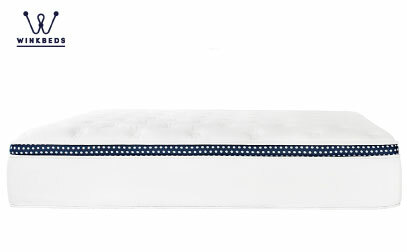 The bed can be purchased at two different heights – the Custom Slim at 11.5 inches and the Premier Luxury at 14.5”. This option can help you get the aesthetic you are looking for and the Custom Slim works with adjustable bases. In addition, choose from their popular Luxury Firm, Plush Soft, and Firm comfort levels for further customization. The WinkBed is a hybrid with a coil-on-coil design that has quick-responding foams on top in addition to a layer of micro-coils and a base of 8-inch tempered steel coils. Both coil layers are pocketed, so each spring compresses independently and serves to help isolate motion in order to minimize transfer throughout the bed that would risk waking a partner. What makes it special? Unlike lesser designs that can break down over time, the WinkBed holds up extremely well and the brand prides itself on using durable materials and construction, making it our pick for Fantastic Durability. There is a very low risk of support dwindling and materials sagging over time, which is backed up by a test conducted by a third-party that simulated extended use. The coil-on-coil design has a lot to do with its durability, as does a reinforced dense foam perimeter. Handcrafted in the States with high-end materials, sleepers can feel supported for the long-haul. Like the sound of WinkBed mattress? Click here to read our full review. With so many mattress choices available, sometimes it’s hard to know where to look for a great value. Enter DreamCloud, a hybrid bed so full of high-quality materials and luxury features that we’re impressed they can offer it at such a good price. What stands out? DreamCloud’s exceptional value stems from qualities like the inclusion of cashmere in the cover, tufting, and a mix of materials with coils and multiple styles of foam. It stands at 15 inches thick, which is substantial, especially when considering that is compressed and rolled for convenient shipping. 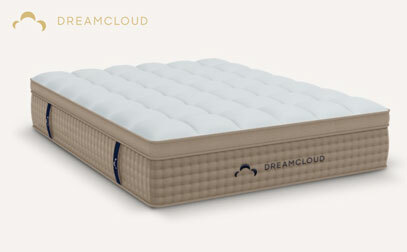 DreamCloud manifests even more premium features, like reinforced edge support and handles that are such an underrated addition to help with mattress repositioning. There is plenty of risk-free time to make sure you love it – 365 nights, to be exact. Take a full year to decide if this is the mattress you want to sleep on for many more years to come. To read more about the features, see our full bed analysis here. Created by Nest Bedding, Alexander Signature Hybrid is a design that benefits sleepers looking for overall comfort and support. Its layers are optimized for cooling, from the airflow through the coils to conductive copper and EverCool foams, as well as phase change fabric. It has a good level of bounce that makes it easy to move around on, which is convenient when changing positions in the middle of the night. What’s its best feature? 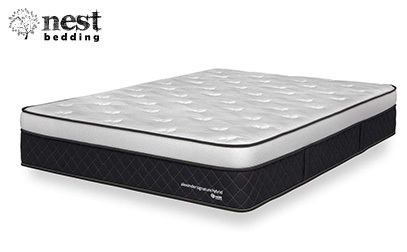 Unlike other hybrids that may feel more like an innerspring or foam bed and not a combination of the two, Alexander Signature Hybrid has a balanced feel of both. Comfort and support can be enjoyed in equal measure. The brand provides three firmness options during checkout, so whether you are a strict side sleeper who needs the pressure relief of their Plush model, a stomach sleeper who would love the extra firm support of their Luxury Firm, or a back/combination sleeper who would likely find the Medium most comfortable, Nest Bedding has made it easier to find a personalized comfort option. If you decide you need another firmness level, you have 100 nights to initiate an exchange or the same amount of time for a fully refunded return. Want to learn more about the Alexander Nest Signature Hybrid? Read our complete review here. 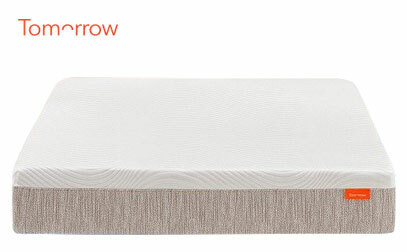 If you’re looking for a memory foam feel that is enhanced by supportive coils, the Tomorrow Sleep hybrid has you covered. Its comfort layers are slow responding and allow for a deeper cradle that supplies pressure relief and comfort, while also providing the benefits of bounce. It is available in firmness levels of Medium Soft and Medium Firm. What makes it special? 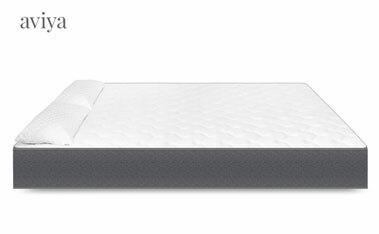 Tomorrow Sleep incorporates springs and three types of foam with more of a memory bed feel. It even has excellent motion isolation when compared to many other coil beds because each coil is individually pocketed and the thick memory foam layer on top helps to absorb movement. Although some people worry about overheating with memory foam, Tomorrow Sleep has included phase change material on the first layer that helps with cooling. The coils naturally help with temperature regulation because of the airflow through its layer, and edges with a thick reinforced foam design have holes that help with aeration. Direct-to-consumer brand Aviya is our budget hybrid pick that feels as good on the wallet as it does on the body. Free shipping saves you even more of your hard-earned dollars. Aviya sells their bed to consumers and hotels alike, so you could spend each evening feeling like you are relaxing on vacation. What stands out? In-store hybrids can scale up to a few thousand dollars, and the Aviya falls in the budget range for this type of bed, with aspects that are surprising for the price. Aviya isn’t compressed during shipping, so it can use a strong foam border for solid edge support, and it has great airflow and bounce. There is less sinkage on Aviya, helping the body to stay comfortable without overheating, and zoning for more support in heavier regions. A selection of firmness levels are available during ordering, and you can test out your purchase for 100 nights. Want to know more before purchasing? See our review of Aviya where we mention everything that you need to know about this model. Passionate about making green mattresses that create a healthy sleeping environment for the entire family, Avocado is an eco-friendly solution with latex and innersprings that stands out in the bed-in-a-box marketplace. Unlike many of the brands out there, they refuse to use petroleum-based poly foams and opt instead for materials like upcycled coils, natural latex, wool, and cozy organic cotton. What makes it unique? Quite simply, its eco-friendly hybrid design. 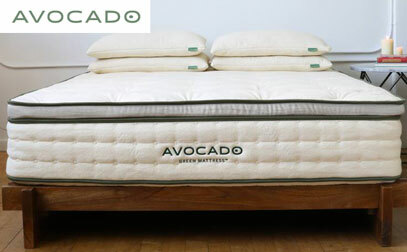 Avocado uses natural Dunlop latex from a sustainable source and springs to provide great rest and peace of mind from the lack of harmful chemicals. Avocado has almost too many certifications to list. Their product is has achieved GREENGUARD Gold Certification, a distinction that speaks to low emissions, as well as natural latex and Global Organic Textile Standard certifications (the latter for the cotton cover). The company is so committed to its mission that it gives back 1% of revenue to protect the planet. Interested in this Eco-Friendly model? Check out full review that we made here. Beds of this type are viewed as having a more traditional, bouncy feel and are primarily classified as including innersprings inside. It very well may be the type of product you slept on each night growing up. These can come in different gauges and be connected, pocketed, or a different design. As there are many different styles, we will provide a breakdown of what is on the market to help you see which fits your lifestyle best. Innerspring beds come in a variety of models. Below we will have a look at the main coil designs and their pros and considerations, as well as why coil count and coil gauge are important factors. Often considered the best type by customers, this design is also referred to as pocket, encased, wrapped, or Marshall coil. This kind of bed consists of hundreds or even thousands of individual coil springs, each sitting in its own fabric pocket. As they are not attached to each other, the springs can move independently of each other. This type of spring system conforms to your body, distributing your weight evenly and preventing pressure points that can cause back and shoulder pain. For this reason, pocket spring mattresses are known for providing supreme support. The individual springs also help prevent motion disturbance, as, if you move, your partner does should not feel it on their side. Due to these highly desirable features, pocket spring beds are usually the most expensive of all four types but there are some really affordable brands out there. Open coils, also commonly called “the Bonnell,” is the oldest and most common type of spring system, and is often found in cheaper innerspring mattresses. The open coil design consists of multiple springs, which are interconnected within a wire frame. 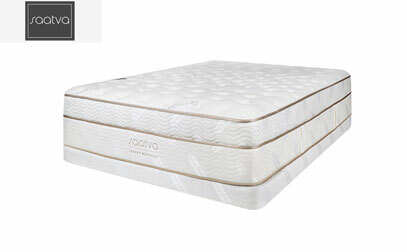 A standard double open coil mattress usually contains about 300 springs. This design usually provides a very firm support. They are used in some orthopedic mattresses for this reason. They are also typically lighter than pocket spring mattresses, making them easier to turn. Unlike the pocket spring, however, some can “dip” in the middle over time. Couples may notice movement from their partner, and roll-together can be an issue, too. Offset coils are similar in structure to open coils, except each spring is hinged together by a helical wire on top. Like pocket coils, this design provides body contouring and better motion isolation. However, they can be made firmer than a pocket coil, as the hinging effect allows more load-bearing on the springs. This type of bed can be an excellent choice if you want a softer surface with a firm, supportive core. As the name suggests, continuous coil (also known as Mira Coil) beds are made up of rows of coils, going from head to toe, using a single piece of wire. These are then attached with helical wires, forming an interconnected network. 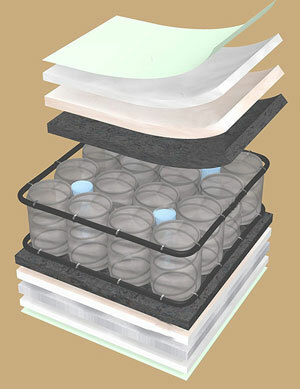 This design can provide a durable, firmer, and supportive mattress at a low cost. However, they do not conform to your body in quite the same way as pocket spring and offset coils do, and they can be noisy. The coil count is the number of coils (or springs) inside the mattress. This amount can range from 200 in a Twin to 1000 in Queen size bed, or 2000 in a high-quality King size bed. More coils tend to indicate a better-quality mattress, as the more springs there are, the sturdier it will be. This means a more supportive and longer-lasting bed. It may not come as a surprise, then, that the higher the number of coils, the higher the cost. As a general rule of thumb, anything under 300 is considered poor quality. However, do bear in mind that the coil count isn’t the only thing that matters regarding quality. The coil gauge is just also important. 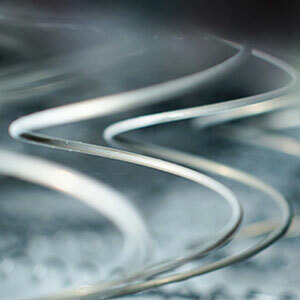 The “gauge” of the coil refers merely to the thickness of the metal wire used to form the coil. Numbers commonly range from 12 and 15, with half gauges in between, but they can sometimes go up to 18. While it may sound confusing, lower coil gauges have thicker wires and create a firmer spring, while higher coil gauges have thinner wires and provide a softer spring. In other words, if you are looking for a very firm and supportive bed, it is best to go towards a 12-coil gauge. If you prefer a bouncy, soft mattress, however, you can go more towards a 13.5 and above. 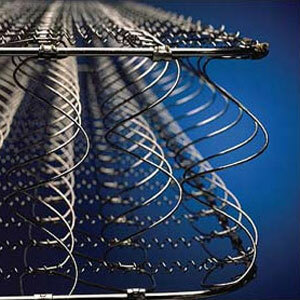 You should always compare the number of coils to the gauge of the coils when choosing your bed. This is because a mattress with stronger wires but fewer coils can offer the same or even better quality as one with more but thinner coils. Innerspring beds do not mold so much to the shape of your body as some other non-innerspring types of mattresses. This means that there is more airflow around you, which helps stop you from getting uncomfortably hot at night. You can also move quickly on this surface, indicating that changing positions and getting up doesn’t require nearly as much effort. Innerspring beds are sold in a wide variety of models from a large selection of brands. This means that there is likely to be one to suit your needs as well as your budget. Whether you want firm or soft, large or small, and with or without a memory foam or latex topper, you are sure to be able to find the right model for you. As there are so many models on the market, there will always be an affordable choice if you are on a budget. There are also many models that are a great deal and still good-quality, so you don’t have to give up on your dream of a great night’s sleep. Convinced a budget bed is for you? See our picks here. One of the first things that people think about when shopping is price, especially if they have a tighter budget. Before you consider taking a hand-me-down from your parents or worse, a used bed through the classifieds, you should check out what’s on offer in the online bed-in-a-box space. These companies are able to really deliver on value because of their cost-saving online sales approach and a reduced amount of necessary inventory space. Though not all online brands with innersprings come compressed in a box, some are able to achieve this compression and roll-up, which can be useful if you’re moving it into your space by yourself. Have a 7-story walk-up? It’s much easier to convince your roommate to help you carry a box than the full-size. Interested in boxed brands? See our picks here. Nearly anyone can benefit from owning an innerspring bed. In fact, some argue coil beds are good for your health because the springs hold up your body to provide the right support and alignment, as well as help to prevent poor blood circulation. Spring beds are an excellent option for larger-set people, according to Web MD, as the firm support makes them easier to get in and out of. 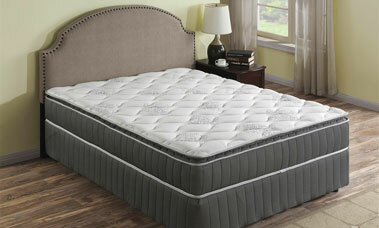 Depending on what position you sleep in, certain types of innerspring mattresses will perform better or worse for you. For stomach and back sleepers, it is recommended that you have a strong core support system to maintain optimal alignment of the spine. Therefore, pocket springs, which help spread your weight evenly on the bed, are a good choice if you fall into this category. Side sleepers can do well with a hybrid innerspring mattress (see our top picks). You still need support from a coil core, but a top layer can provide more a comfortable, pressure-relieving surface. 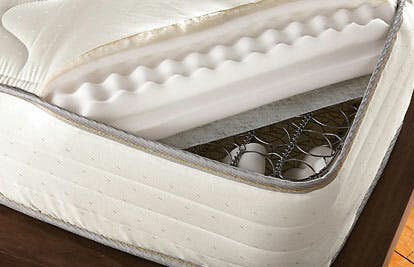 Innerspring mattresses are the traditional choice and are still widely popular today. They provide support, durability, and breathability. There are many factors to consider when choosing a mattress, including spring design, coil count, and coil gauge. These all contribute to how durable, soft, or firm it is. There are so many different models to choose from (we even selected our top 12 here), which can be frustrating when you are trying to select a mattress, but it also means that there is going to be one to suit your needs. Hopefully, our how-to-buy guide has cleared up some of the mattress-related mysteries that were on your mind before you read this article. Get Holistic Health. (2012). How an Innerspring Mattress Benefits Your Health. Retrieved from the web on May 15th, 2017. Hawks, Leona K. (1987). Selecting an Innerspring Mattress. Retrieved from the web on May 15th, 2017. Zamosky, Lisa. How to Pick Your Perfect Mattress. Retrieved from the web on May 15th, 2017. I have an Alexandar Hybrid and I just love the way it combines traditional and modern. Are hybrids better than regular innerspring? They’re better at contouring your body but more expensive, too. It depends on what you need. I have a plain innerspring and it suits me just fine. But, it’s individual, you should try both and see what works for you. Hybrids are usually seen as the “best of both worlds,” but they are also more expensive in general. It’s also a different feel due to the top foam layer. I worry about all the materials they put in mattresses today. I would prefer something healthy and eco-friendly. any suggestion? I’d love to buy an eco-friendly mattress, too. Unfortunately, I have a limited budget at the moment. Is there something cheaper than Avocado, but still with good performance? I’m not sure about innerspring. But Tuft & Needle is organic, eco-friendly and pretty affordable compared to other manufacturers. But, it’s memory foam. I have one myself and I’m satisfied. Hi Jessica! We have a list of best ecofriendly brands. Maybe one of these would be a better fit for your budget. Best of luck! I have an Aviya Queen, it’s also chemical free and has a very good performance. It’s exactly how I imagined it will be. Couldn’t be happier. I couldn’t agree more. At first I didn’t want to change my old mattress but my husband finally convinced me and purchased Aviya. Now I can’t believe what I’ve been missing all this time. I’m loving it! I’m a side sleeper and my husband sleeps on his back and it’s ideal for both of us. Is Aviya good for a stomach sleeper? It works with all positions, at least for me. I don’t think you can find a better mattress at that price. I had my doubts, but now I’m absolutely sure in my choice. One of the best investments, I might say. Hi Steve. Stomach sleepers need to look out for their hips because if they dip too deeply into the bed, your spine may not be comfortably aligned. What bed works well for each individual stomach sleeper depends on your body shape but in general, they prefer firmer beds. I hope this helps!